"He treated our home as if it were his own." "Craig and his crew exceeded every expectation." "Craig is truly a master builder." 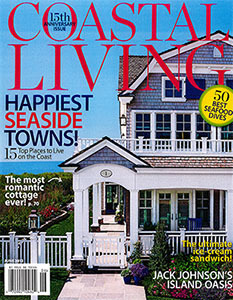 We are again honored to have another one of our homes featured in Coastal Living Magazine! "...An electric palette and inviting outdoor hangouts dial up the fun factor at this cheerful Jersey Shore retreat..."
We're honored to have a home that we built chosen for the 15th anniversary cover for Coastal Living Magazine! "...Classically picturesque, storybook perfect but never prim, this house in Stone Harbor, New Jersey, exudes a happy balance between practicality and panache. The New York-based homeowners needed their beach house to have enough dexterity to handle sun, salt, and sand—plus all the wear and tear an active family can dish out—while maintaining its graceful New England cottage charm. An Americana mix of blue and white starts outside, with classic white trim, a refined gray-shingled facade, a white fence, and smart navy shutters. That classic style hints at the nautical palette throughout the home’s interiors, which met the owners’ desire for down-to-earth aesthetics..."